Humans have been using plant materials for millenia, from everything from food to shelter, and from clothing to medicine. In these modern times of concrete homes and packaged foods, it is easy to forget how dependent we are on plants, but make no mistake: if plants were to suddenly disappear from the planet, we wouldn't survive for more than a few weeks, at best and probably mere days. Did you know that scent has been so important in our lives that the Ancient Egyptians had a goddess of fragrance? Her name was Nefertem. By now I am sure you have heard of aromatherapy. If you have not, then likely you have been living in a cave these past few years. Aromatherapy has become quite popular, so popular that it is a mass market product these days. But, essential oils are very powerful and can be harmful when directly put onto the skin, are ingested or are mixed in with foods. That is why it is important to understand the nature of essential oils when working with them. Aromatherapy and essential oils are more popular than ever, as more and more people discover that concentrated aromatics can be used in a therapeutic way, to address imbalances in our bodies that can lead to poor health. Diffusing essential oils can improve your health and well-being. 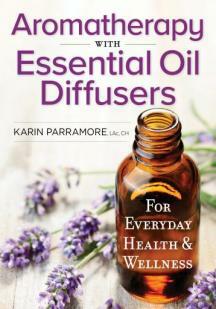 In this perfect companion book to your favorite diffuser, Karin Parramore teaches you how to diffuse essential oils, from ammi to ylang ylang, to improve your physical, mental and emotional health and to destress your time, your work space and even your car. Part 1: covers the history of aromatherapy, explains the different types of diffusers and teaches you how to choose, use and store essential oils. Part 2: provides detailed instructions on diffusing essential oils to treat various health conditions and offers over 160 formulas for specialized oil blends. This book is about aromatherapy. Specifically, it's about how to diffuse essential oils for improves health and well-being. We hear the term "aromatherapy" used a lot these days as essential oils become trendier and more people become familiar with them, but what exactly does it mean? At its most basic level, the meaning of "aromatherapy" is right there in the word itself. The use of aroma, or smell, in a therapeutic way. We use it to address imbalances in our bodies that can lead to poor health. For example, let us take a type of diffuser, such as the one I have seen, an electric one. This is the type that diffuses essential oils via a heating element. The author is not a fan of these because they disperse the oils too quickly. And they tend to wear out fast. However, they are useful for dispersing thicker, more viscous oils that are hard to diffuse. She really covers the different types of diffusers very well, as well as the pros vs. cons for each of them. Next the author discusses various types of oils and what each oil does. She discusses how essential oils are created so you understand the process that goes into getting these concentrated oils, as well as 64 of the most essential oils there are, and which ones would go best in a skincare oil but does not go into which are poisonous when taken internally and which would cause the most reaction to the skin when put onto it undiluted. I think the author should have discussed this as it is essential for those who don't know and might try to take them internally. In Part 2 she goes over different blends and how to use them in a steamer or diffuser. How to get the most out of each blend. Such as a blend for hormonal acne, to be used in a facial steamer. That is one I would recommend. Or acne with blackheads. She even has one for hot red acne and cystic acne. I like that there are so many blends for acne, which I can now add to my arsenal for treating acne. She goes into allergies, pain treatment, infected tissue, etc. There are almost treatments for everything. Karin Parramore LAc, CH, teaches at both the National University of Natural Medicine and Ashford University in the Bachelor's Complementary and Alternative Health program. She obtained Chartered Herbalist status from Dominion Herbal College in 2001 and has a degree in Chinese Medicine from the National University of Natural Medicine. Karin has been a practicing aromatherapist since 2002. She lives in Portland, Oregon. Aromatherapy with Essential Oil Diffusers by Karin Parramore (216 pages) is available online at www.robertrose.ca or www.amazon.com.